In support to the disaster relief activities by the Govt. 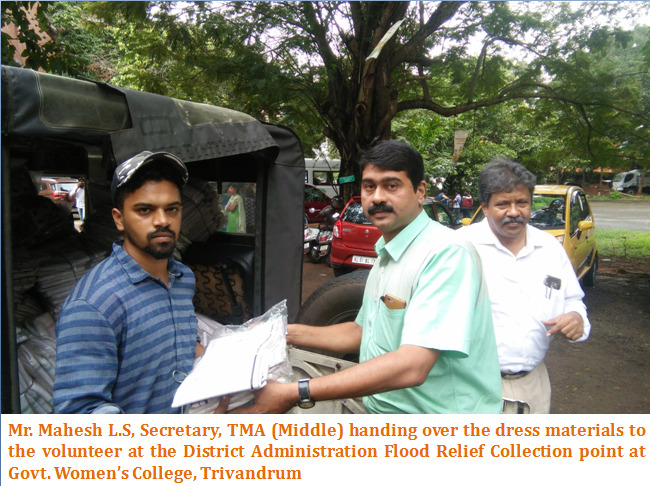 of Kerala, Trivandrum Management Association (TMA) members has contributed the dress materials worth of Rs 2,00,000/- (Two Lakhs) to the District Administration Flood Relief Collection point at Govt. Women’s College, and other relief camps in Trivandrum. Also the MC members of the TMA had been actively participating in the flood relief work, which helped the affected people immensely and took the relief operations forward.